Do you make weekly runs to the thrift store and antique mall? Scour flea markets and plan weekends around yard/garage sales or estate sales in the quest of vintage finds to complete your decor, add to a collection or to use in your in your newest craft project?Does your pulse race ....temp rise....find it hard to focus....loose all sense of direction upon arriving at your destination? No fear. You're experiencing 'vintageitus'. It's a perfectly normal effect of the vintage quest. A sure way of alleviating these symptoms is to join our weekly party and posting about your 'vintageous' item(s). This weekly ECS Blog Party is open to everyone. Please chjeck the Blog Party Rules page and use the Inlinkz below to join the party. I absolutely love thrifting. Is there any other way to shop?!! My "Springtime" post is chocked full of thrifted treasures. 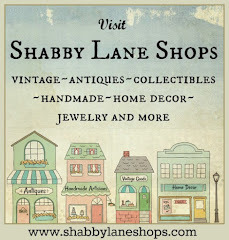 My new blog header includes several of my thrifted treasures. I hope you'll take a minute and stop by. My log sidebars are a photo of an old vintage tattered quilt that I found thrifting.